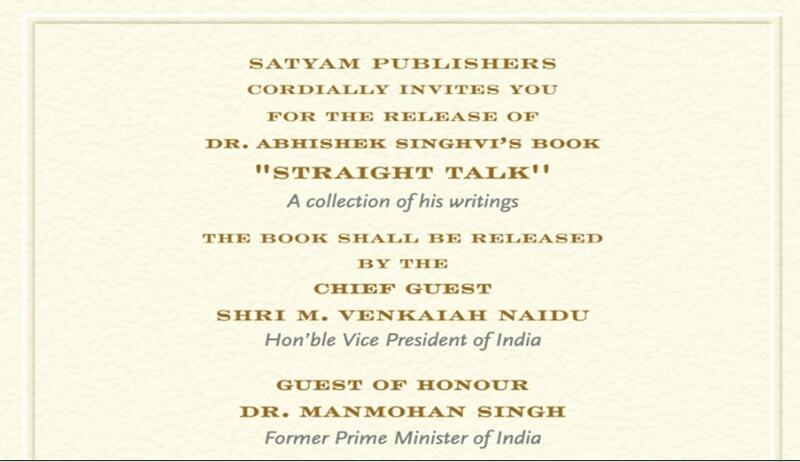 ‘Straight Talk’, a collection of Abhishek Singhvi’s writings, shall be released on Wednesday, the 30th of May. The book shall be released by Guests of Honour Vice-President M Venkaiah Naidu and former Prime Minister Manmohan Singh, The book is being published by Satyam Publishers. A panel discussion on ‘India at 71: Hits and Misses’, involving P Chidambaram, Prakash Javadekar, Jyotiraditya Scindia, Dinesh Trivedi and A Kanimozhi would also take place. The panel discussion would be moderated by Barkha Dutt. Guests are requested to be seated by 5:45 PM. An original invite and an identity proof are required to attend the event. The invite and the schedule for the event can be found here.